Plane9 is a free and commercial (4.95 euros) 3D visualizer. 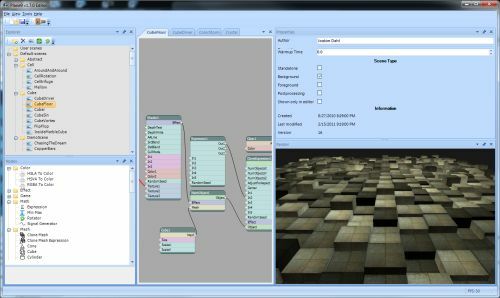 You can create your scene with an node-based editor. The scenes are saved in a readable format so you can also modify them with a text editor. Plane9 comes with more than 100 tutorial scenes and the rendering engine is based on OpenGL API. More information and downloads: Plane9 homepage. In love with Music Visualizers, however the Mildrop on Winamp seems to run better than the Linux ProjectM port, Do you know of anything other than Winamp 5.5 that will run in Wine or with Crossover Linux? comes from now…go into winamp’s Options->preferences->plug-ins->visualization.